It was almost a week ago when I got a text from my friend, Debbie with a picture of a cute, cute chair and the question “Do you want it?” She had found it in a shop that re-paints and finishes furniture and other items, giving them a new shabby chic look. 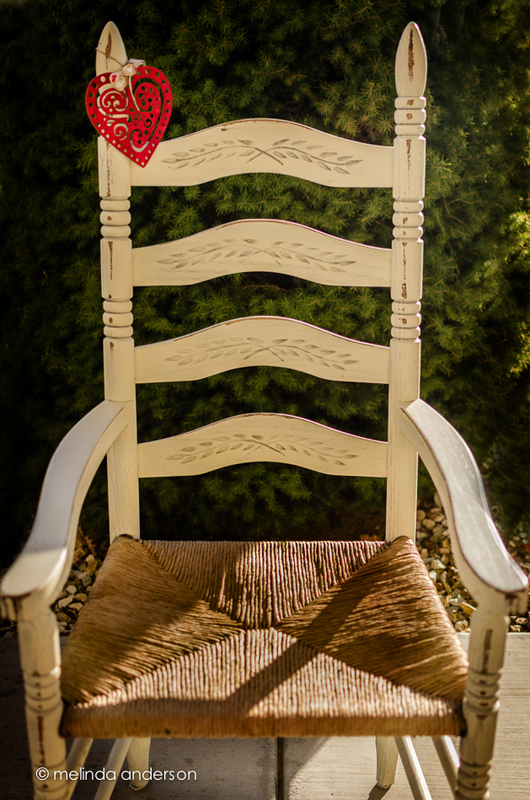 Debbie knew I was looking for a cheap, vintage looking chair for my still life photography- and I fell in love with it immediately. Although my husband was just out of the hospital, he drove me down to the little shop, and I made my purchase. I was originally planning to put it on the front porch, but I’m enjoying having it in my living room. I’m thinking now it will winter indoors and summer on the porch. You might have noticed my new chair earlier in the week as a backdrop for daisies and roses. 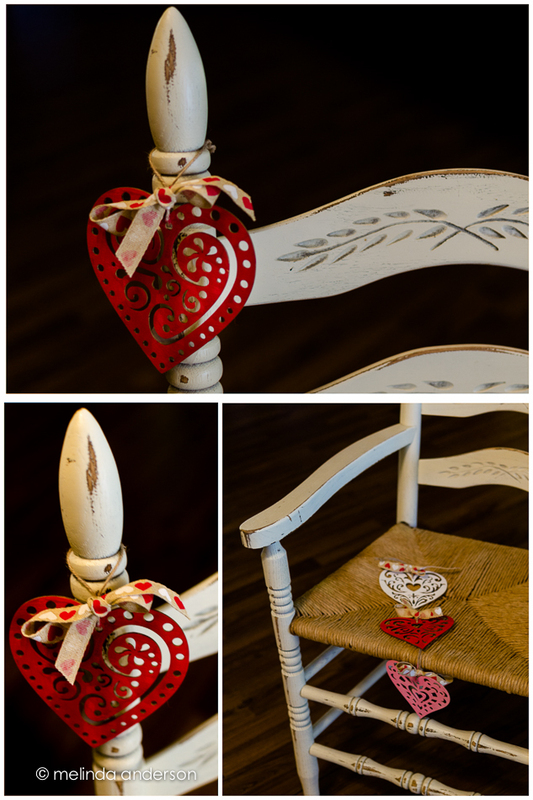 Today I’ve gotten on the Valentine bandwagon and have added hearts to my chair still life. Linking up with Friday Finds. This entry was posted on February 13, 2015 by Melinda. It was filed under Friday Finds, still life and was tagged with chair, photography, still life, vintage. Good find and good to have friends on the look out. Love your little painted hearts that was in yesterday’s post also here. Perfect for Valentines. This chair is absolutely a keeper! A terrific find. I think you owe your friend a nice lunch. 😀 Happy Valentine’s Day! What a fabulous find! Love the delicate hearts. Did you make them yourself? What a great chair and the hearts compliment it very well. Great photos! Great chair and lovely pics. It’s nice to have friends looking out for you!